Unassembled ARGON Vacuum Tube Rectifier Power Supply Kit. Another Pirate Pete Electronics Exclusive , available nowhere else! LIMITED production kit , available only as long as our tube stock lasts. Watch our product video here. This is a very interesting and unique electronic project kit. 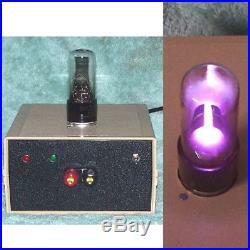 You construct a power supply, featuring a low-voltage,’purple glow’, Argon gas vacuum rectifier tube! The more current the circuit draws, the brighter the purple glow from the tube! The kit also teaches basic regulated power supply design as explained below. In order to keep costs as low as possible, the kit comes with a 350mA power transformer. This transformer supplies a nominal unloaded voltage of 19 volts DC. With a 220mA load, the output voltage is 15.4 volts. With a 350mA load, the output voltage is 12.1 volts. See our other listings for a higher power 96VA (watt) transformer, for higher output voltage and current. Maximum recommended output is 2 amps. Complete kit with all necessary parts, including case, two power transformers, hardware, and all necessary components for one LM317 adjustable voltage regulator, to provide a regulated variable output. Kit features printed circuit construction. Circuit board has provisions for two LM317 regulator circuits, a 78XX series 3-terminal fixed regulator, and a discrete zener diode – transistor regulated supply, to teach and demonstrate basic power supply theory. Case comes with predrilled hole for vacuum tube mounting, and all hardware necessary. User must drill small holes as necessary. Instructions are supplied on a CD-R. We have never experienced a tube failure in our design and testing development. The tube has no part number or markings. Kit requires moderate electronics assembly skill, not for beginners, not for sale to minors. Unlimited uses, excellent for model railroad use. Connect it to a load resistor, and just use it for a fascinating conversation piece. For a limited time, we are including a digital Volt – Amp readout display for free. This will display voltage and current output, see photo. It is assumed that the unit(s) will be installed and operated by qualified personnel. Not for sale to minors. Check out our other listings for more Radio, Electronic and other UNIQUE items. High quality Pactec case. Kit includes all parts. Boxed and tested rectifier tube. Tube has no part number or markings. The actual tube glow is more purple than the purple/white color picked up by the camera, and the filament is visible through the purple gas glow! Large top hole for tube socket pre-drilled. Tube socket can be directly mounted to board. Kit comes with one LM317 regulator circuit as shown above. Board has provision for four regulator circuits, including a classic, discrete diode transistor circuit, to teach voltage regulator theory. Kit currently comes with BONUS digital Volt Amp meter. See our other listings for an optional 96VA (watt) transformer, for high power operation. Power Supply would make an incredible companion to our 1-tube vacuum radio kit. See our current and upcoming listings, for more of our EXCLUSIVE PC board kits! The item “ARGON Power Supply UNBUILT KIT vintage VACUUM TUBE rectifier radio electronic PS” is in sale since Thursday, May 24, 2018. This item is in the category “Consumer Electronics\Gadgets & Other Electronics\Other Gadgets”. The seller is “ppelectronics” and is located in Middlesex, New Jersey. This item can be shipped worldwide.